1. Mix all the dried fruits in a bowl and pour over the coffee liqueur and 25ml vodka. Stir together and then cover the bowl with clingfilm and leave to steep for at least 6 hours, preferably overnight. 2. Grease a plastic or glass heatproof 1.5-litre pudding basin (one with a lid works best) with butter and set to one side. Half fill a large saucepan with water and put on the boil with the lid on. 3. In a large bowl, stir together the remaining pudding ingredients, except the vodka for lighting, until well mixed. Pour in the steeped fruit and all the liquid in the bottom of the bowl and stir to combine. 4. Scrape the mixture into the greased pudding bowl and secure with a lid, then wrap the basin in foil. If you don’t have a basin with a lid, wrap the bowl in a double layer of foil. Place the pudding into the pan of water and steam for 4 hours. Be sure to top up the water regularly to stop the pan boiling dry. 5. When the pudding has steamed for 4 hours, remove from the pan and carefully unwrap. Keep in an airtight container in a cool, dark place until ready to eat – the pudding will keep for up to 6 weeks and will improve over time. 6. 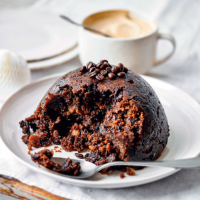 On the day, rewrap the pudding in foil and steam in the same way for a further 3 hours. Turn out onto a serving plate. Warm the vodka in a small saucepan or in the microwave, pour over the pudding and light to flambé. 7. To make the cream, mix the coffee granules with 2 teaspoons boiling water to make a paste and add it to the cream. Stir in the sugar and whisk until soft peaks form. Serve with the pudding.